More than two months after the first ‘345’ carried passengers, TfL Rail has started using Aventras on peak-time trains between London Liverpool Street and Shenfield. The new EMUs had previously been restricted to an additional rostered duty in the morning on the Metro route to Shenfield. “Following the introduction of the first new Class 345 trains in June, peak services began running between Liverpool Street and Shenfield at the end of August,” said Howard Smith, Operations Director for TfL Rail. TfL Rail leases 315818-315861 from Eversholt Rail. All have undergone refurbishment, including modifications to make them compliant with accessibility laws required for trains to remain in traffic beyond December 31 2019. They usually run in pairs, and have been used on the route since their introduction. Their future remains uncertain - one possible home had been the Welsh Valleys, although uncertainty regarding electrification has seemingly put paid to that. 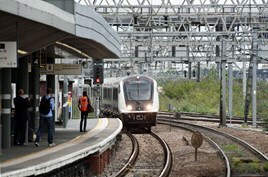 Read about developments in London in RAIL 834, available on Android/iPad. The new sidings at Chadwell Heath and at Shenfield will cater for 9-car Class 345's plus with Platform 6 at Shenfield now opened and is used by the Class 345's aswell the Class 315's which are due to be replaced when more Class 345's have been delivered and the Elizabeth Line opens in late 2019. Been on few of these new trains. Very nice trains.